I find this a versatile recipe. 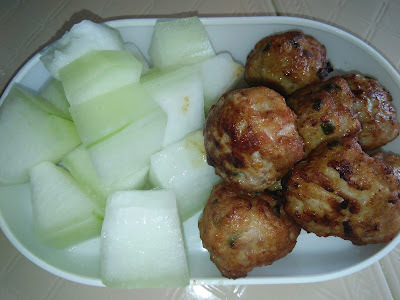 The fried meatballs can be served on its own with or without a dipping sauce, braised with winter melon or cabbage or cook as a soup. Here, I have choose to braise it. 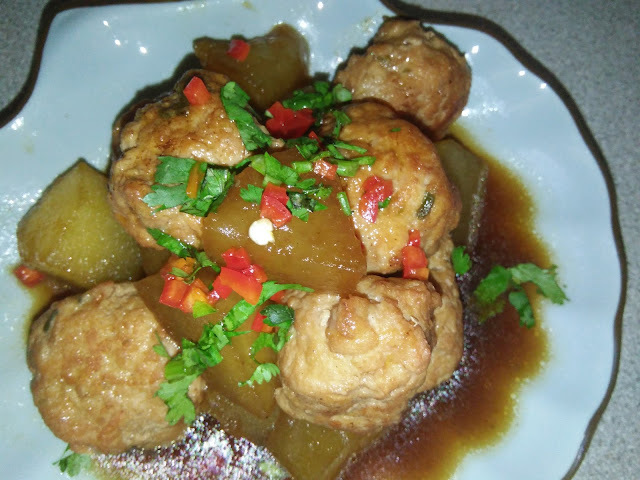 The meatballs on its own are tasty, braised, the winter melon absorbs the flavours of the seasoning and gingery aroma of the meatballs. 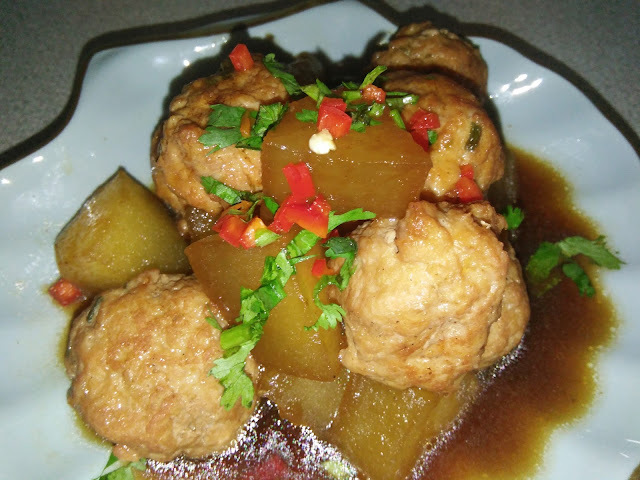 Pulse meat pieces with ginger and the marinade several times. You can do it in batches if you are using a small blender. 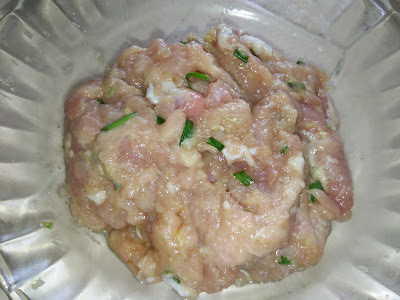 Scrape into a bowl, add in chopped spring onions and mix well into round. 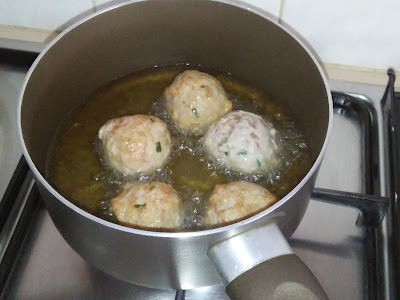 Leave to rest for 15 minutes in the fridge. 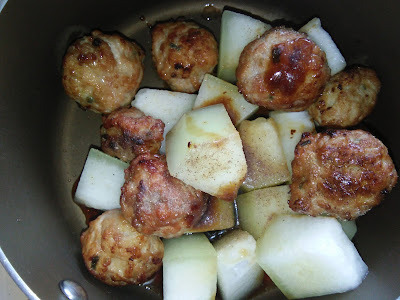 Deep fry the meatballs until golden brown and cooked through. Drain and serve immediately with chilli sauce or set aside for braising or cook in soup. 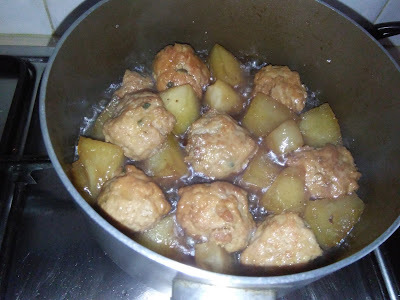 For braising - place fried meatballs, winter melon, seasoning and water in a pot. Bring to boil and simmer until winter melon is soft and water reduced. Dish up to serve. 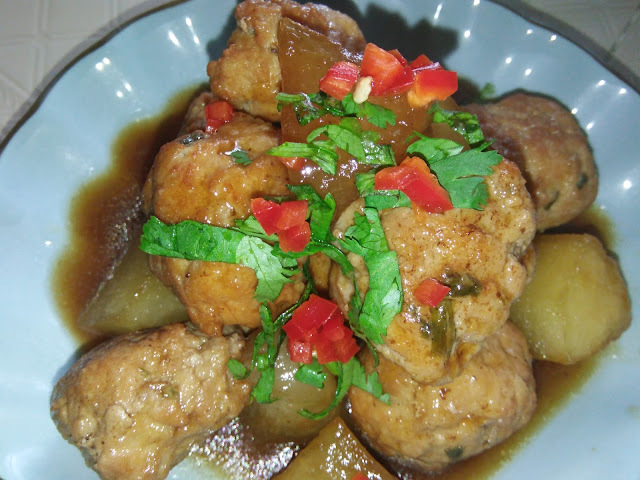 Garnish with chopped coriander leaves and red chillies. Hi Kimmy! 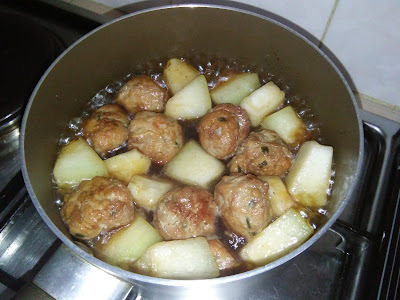 I have never ever thought of pairing meatballs with winter melon! A good day to you. I am a Sunway University student currently pursing BSC (Hons) Culinary Management. I would like to have an interview with you regarding your motivation in starting a food blog and maintaining it with other social media. Hi Phong Hong, this is a lovely dish. I had it with plain white rice and also with blanched noodles. Very easy and convenient. Hi Suk Leng, I will be glad to assist you with the interview via email.